For many brides, dancing with their father at the wedding is an emotional moment, but for Mary Bourne Roberts it was particularly poignant. Mary's father Jim is terminally ill, having been diagnosed with glioblastoma, an incurable form of brain cancer, in May 2017. Jim started hospice care in December and it was not known whether or not he would make his dance teacher daughter's wedding on December 29. 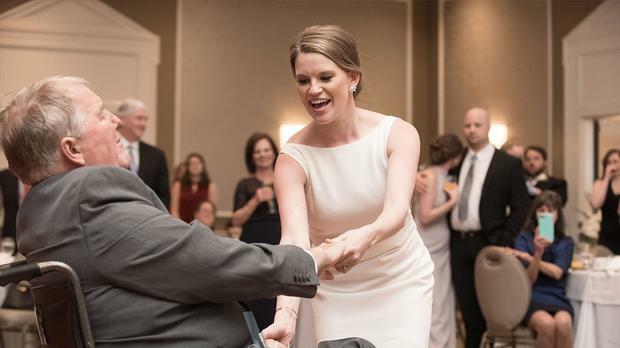 However, Jim was determined, and the father and daughter shared the joyous but emotional moment on the Big Day, with Jim taking to the dance floor in his wheelchair. Assembled friends and family watched as they performed a routine to 'their song', Lee Ann Womacki's 2000 hit 'I Hope You Dance'. Jim had planned to dance to the song at Mary's wedding ever since she was a child.